Along with an abundance of cigarette smokers, is an abundance of cats. Yes, cats. 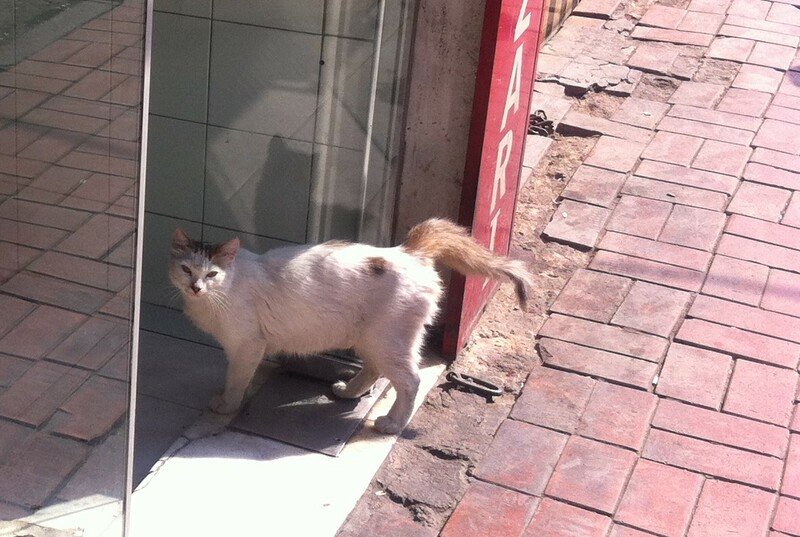 I have never seen so many wild, healthy looking cats in an urban area. 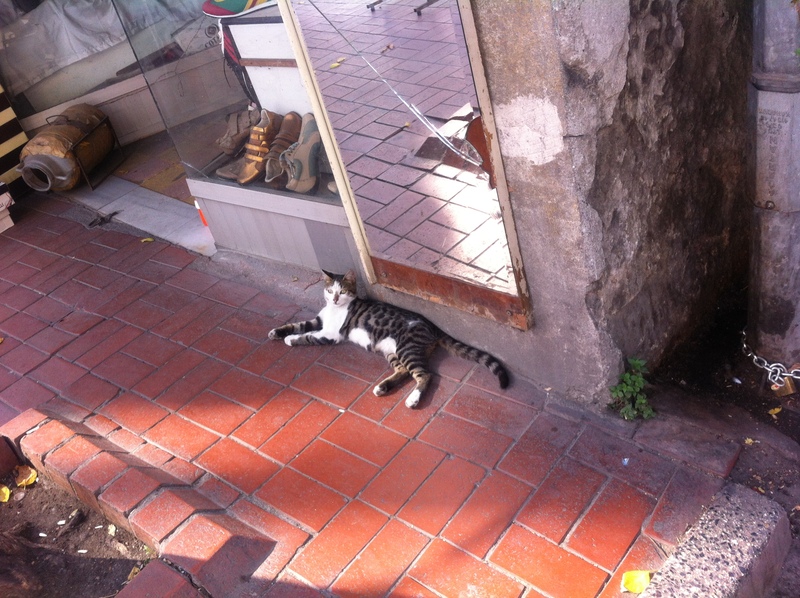 Why are there so many cats in Istanbul? Well, I learned that Islam tells of a cat thwarting a poisonous snake that had approached the Prophet Muhammad. Another story says that the prophet found his cat sleeping on the edge of his vest. Instead of removing the cat, the prophet cut off the portion of the vest that was free and wore it without disturbing the pet. So cats are viewed as somewhat of a spiritual symbol, to be treated with care and fed. Two of them circled my table at a street café and seemed perfectly relaxed and okay doing that. I had to continue to shoo them away while I quickly and protectively ate my food. Maybe I should have shared. 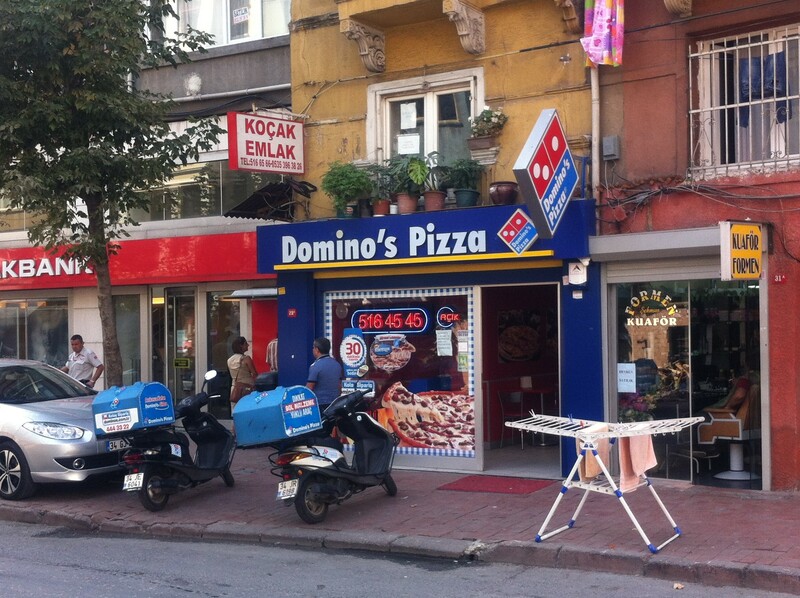 A funny thing happened on the way from the Grand Bazaar. 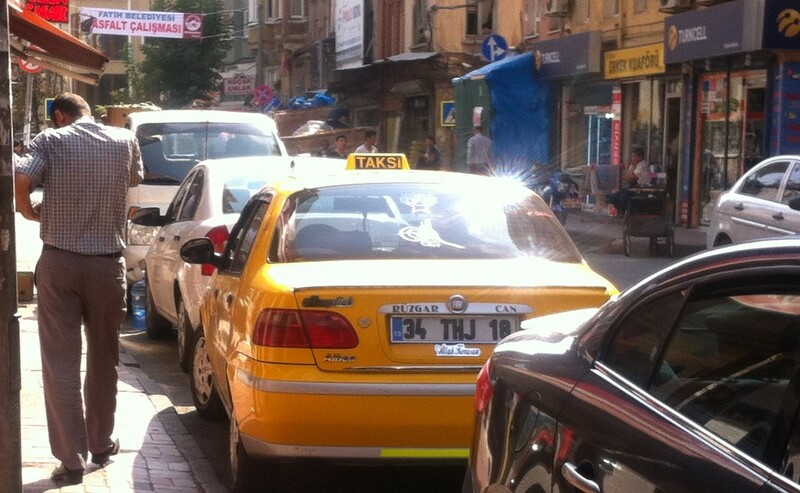 My taksi driver didn’t quite seem to know how to get to my hotel, and drove down and backed out of several streets. While smoking and cursing at yet another one way street that was blocked by posts, he jumped out of the taksi and started screaming and yelling at the traffic officers (yes, traffic is so bad in Istanbul that they have traffic cops everywhere). He wanted to drive over the blockade; the traffic cops said no. A large crowd encircled the cab, with me in the backseat trying to partially hide my face, and a fistfight almost ensued between the cabbie and the cops. The cabbie finally got in and drove off. No tip. I’ve also noticed a conspicuous absence of the use of deodorant. Occasionally, there is an overabundance of cologne and perfume, but more often, the absence of anything at all. And, this seems to be an equal opportunity phenomenon. Baking soda anyone? Just saying. The housekeeper and the general maintenance guy, Sevim and Omet, are sweethearts, and make a sincere effort to help me feel comfortable at this small hotel. We also manage to talk with one another, although with my extremely limited Turkish and their equally limited English, we don’t get beyond the polite greetings. But, as I have re-learned, giving and receiving sincere smiles can go a long way toward warming the heart. They bring a smile from my heart to my face each time I see them. There is a park that I have found myself frequenting. 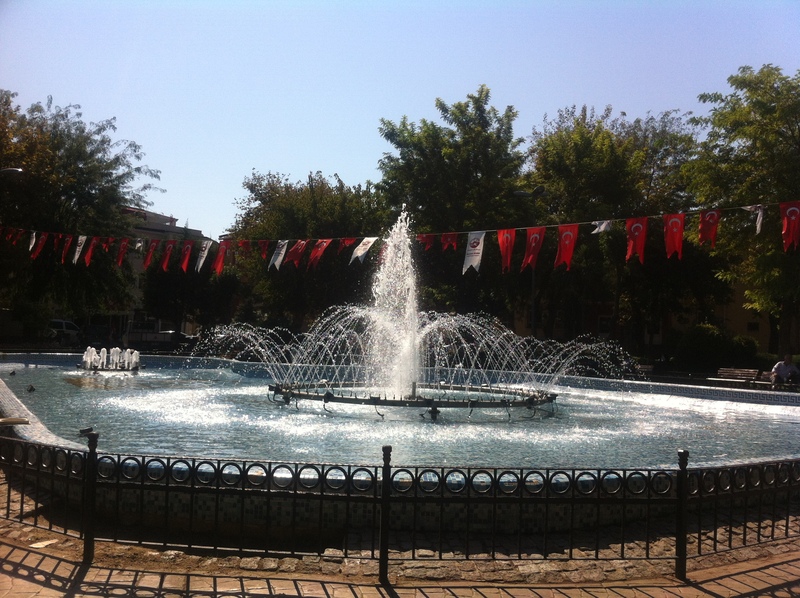 There are plenty of shaded benches, a play structure for the kids, and a beautiful fountain in the center of the park. Today (Saturday) it is warm and sunny as I walk to the park, which is about a 10 minute walk from my hotel. I arrived without breaking into a sweat, and there is a cooling breeze. The weather reminds me of a perfect SF Bay Area day, and I remember that I dreamed about In-N-Out hamburgers last night, thinking, in my dream, that I would run out and get one for dinner. Talk about a rude awakening! I walk toward my favorite café to buy a chicken kebap lunch, and try not to think about my favorite burger. Ahh … another life. But if I get desperate there’s always Domino’s.